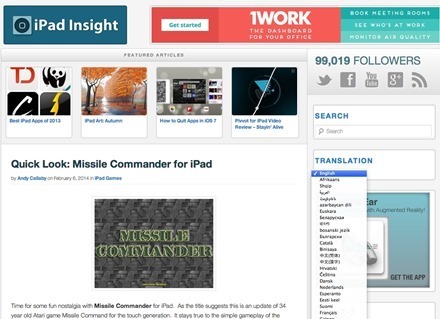 iPad Insight: Now in 82 Languages! iPad Insight is now available in 82 languages. We’ve just enabled a new plugin that translates the site with just a couple of clicks – which we hope will make it far more helpful for many of our readers around the world. This is something I’ve wanted to get done for a long while. I know from watching site statistics that we have a large number of visitors from non-English speaking nations and I’m very glad that we’ve now made iPad Insight far more user-friendly for all of you. I hope you enjoy our iPad app an accessory reviews, iPad tips and tricks, and insight on all things iPad in your own language.